So here's what's not immediately evident from the story. First: I left Greensboro sometime in the 4pm hour, with the intention of getting down in time for any pre-show activities. I got rerouted a few times on and off 85 and its perpetual construction, and after crawling through the actual stadium traffic and parking, I was going to be just in time. Or would have, were it not for some disadvantageous entry management that made it take forever to get in. I missed Winston Salem State - no big deal, which I say not as a dig at the Red Sea of Sound, but as acknowledgment that they're relatively down the street from me. With my first priority being to get in and get seated, I first found myself at the side 1 20 yard line. It actually wasn't a bad spot - the stands element of this year's Battle put me right across from the bands, so I was in the blast zone for both Talladega and Jackson State. But then Christy hit me up, and I headed over to the 50 to hang with her crew. As I mentioned in High Notes, Norfolk State took it in my opinion, but they certainly weren't the only band worth writing home about. Tennessee State's sound was great. Bethune Cookman, while undeniably talented, felt like a business trip, though not as much as Honda often does for them. But my biggest honorable mention goes to Miles, who, among other things, initiated the QCBOB Mass Choir. I will note on Miles' part, part of my intrigue with them was overcoming my own bias. 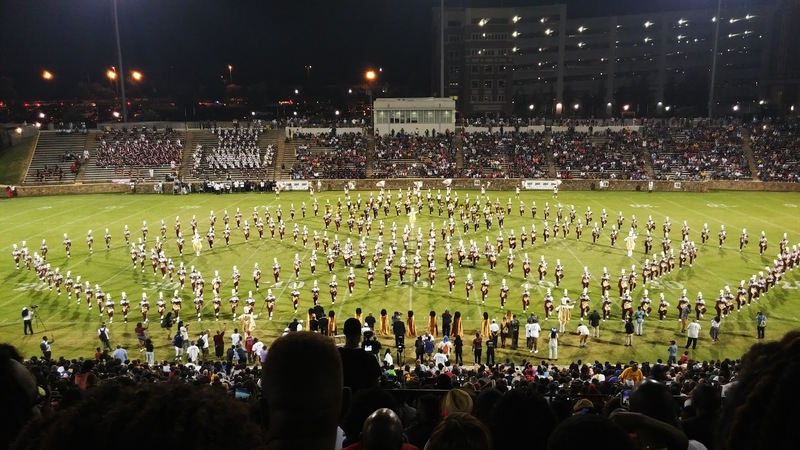 Even though I cognitively know better, I still place higher value on the Division I - MEAC, SWAC, and Tennessee State - bands. Add the regional disconnect, and I really didn't have any expectations for Miles. What impressed me the most was the degree to which every instrument held their own for a full sound. Speaking of sound, QC was a crankfest of sorts. On the one hand, I love a hornline that can push your hairline back, and there was no shortage of those. It was a welcome contrast from earlier this summer in DCI - which I also love - still bringing power but in a different way. I'm told the stands battle was a new element. It's design gave each band two two-minute sets per pairing, but the selections were hit or miss. The SWAC side of the equation - Bama State and Jackson State - fell towards the middle of the pack, taking an L not necessarily to the MEAC, but to the field. Jackson State in particular didn't put their best foot forward, choosing to start their show marching all the way to side 2 for an entrance. I find that my threshold differs from a band-specific event than to seeing bands in a football context, but I will say even the "lesser" bands were mostly enjoyable - sort of the same philosophy of a bad day fishing topping a good day at work. QCBOB was a great time. It was an announced sellout. I don't know where they set that threshold, but the concert side stands were pretty full and there were a good amount of folks on the backside as well. I'd love to see this event move to Bank of America Stadium - as it was rumored earlier this summer - in future years. Charlotte, as a city, fashions itself as an Atlanta proxy as a major southeastern city, and QC is essentially Honda without the name or longevity. They could stand to move into the city's premier stadium. 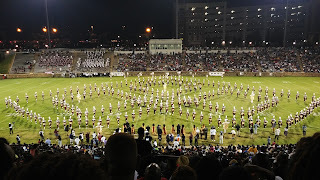 In fact the HBCU band world could do far worse than having QC and Honda roughly bookend the season. Regardless, I'll be back.